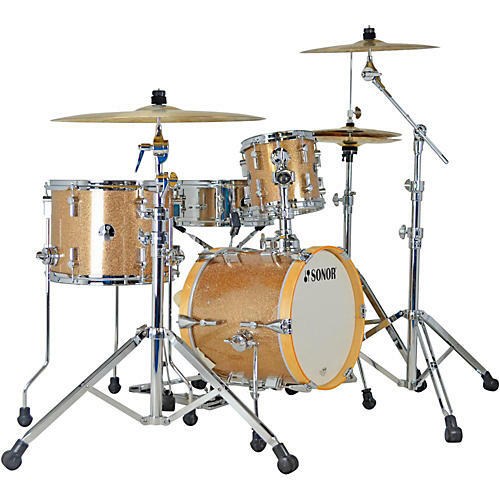 Sonor's Martini SE Shell Pack is a diminutive kit that enables a player to fit their acoustic jazz bossa grooves into the tightest of venues. Cross-laminated, 9-ply poplar shells output punchy tone with ample resonance. A steel snare drum provides those crisp, round tones with the ring you've come to love. Triple-flange hoops will endure all the rimshots you can dish out, while Tune-Safe lugs ensure that the tuning stays in place. The Martini kit comes with an 14" x 12" kick (with mount and riser), 8" x 8" tom, 13" x 10" floor tom and a 12" x 5" steel snare. Bass drum(s): 14" x 12"
Floor tom(s): 13" x 10"